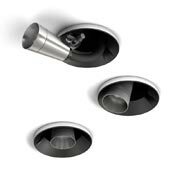 Ingeniously designed to transform from a recessed to a raised fitting in a matter of seconds. When completely recessed, blends completely in with any given surface. Any time you want, and without using tools, pull the optical head out and position it with millimetre-precision. Available with adjustable focused, medium or wide beams and a glare-free lens. Ideal for galleries, museums and retail outlets where displays, designs and moods change. Bebop. It’s more than multi-functional. It’s multi-form.